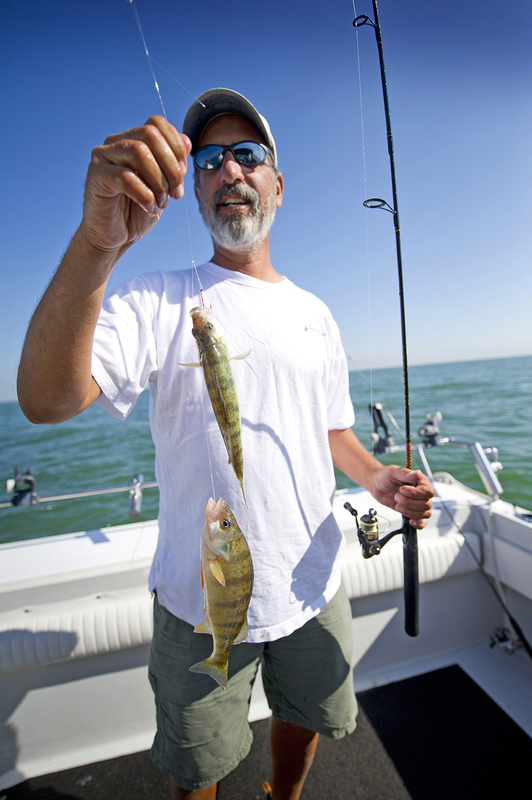 MONROE, MI — It’s no secret that the Lake Erie yellow perch fishery is not what it used to be. Only 10 million 2-year-olds now show up in the catch compared with peak years in the mid-1980s when 70 million to 80 million were caught. Scientists studying the lake and fishery say there are numerous reasons why. They include changing water quality and clarity and the effects of recent warming trends. Yellow perch are a cool-water species. Recent study findings, however, also suggest that Lake Erie’s booming white perch population has had more of an impact than previously thought. They prey voraciously on tiny yellow perch. “The numbers are staggering,” said Stuart Ludsin, an associate professor of evolution, ecology and organismal biology at Ohio State University. Ludsin has been studying the lake and its fishery for 20 years. “There are between 46 million and 106 million predators in the western basin of Lake Erie. In just 24 hours they can consume between 32 million and 189 million yellow perch larvae. That is an enormous number. Walleyes and white bass also prey on larval yellow perch. Even adult yellow perch will “cannibalize” their own young, according to Ludsin, but nothing approaches the volume that white perch eat. His evidence was found in white perch stomachs. Ohio fisheries officials have said they didn’t consider predation as a factor initially because they found no yellow perch in white perch stomachs. Ludsin said larval yellow perch are tiny and digest quickly. It took doing DNA analysis on the stomach contents to confirm their presence. What that means for the future is “hard to predict,” according to Ludsin. White perch is a species native to the Atlantic Ocean. They arrived in Lake Erie in the 1950s, having come in through the Welland Canal that connects Lake Erie to Lake Ontario. “In the 1980s we had a series of four very warm winters. That allowed the small adult population of white perch to survive and get off several very strong year-classes. The white perch population then exploded,” Ludsin said. Recent warming trends, he added, continue to favor the white perch population. But turbid waters, where the clarity is impaired, can be beneficial to the yellow perch. Commission recently called for a 46-percent reduction in phosphorus going into the lake, and a 39-percent reduction in just the west basin. Ludsin’s studies show that young yellow perch survival dramatically increases when wet spring seasons result in high-volume discharges from the Maumee River at Toledo, Ohio. The turbid plume that extends far out into the lake becomes a refuge for yellow perch. There are fewer predators in the plume, and those that are eat fewer perch than those outside the plume. Because of the diminished water clarity, yellow perch larvae are harder to find. The last big yellow perch year-class was produced in 2003, Ludsin said. It still supports the fishery and makes up 75 percent of the catch. A strong year-class, he said, is a game changer. Cold winters, like this one, also can help. They result in more viable yellow perch eggs being laid and hatched. Spring rains also make a difference. This story appears in Michigan Outdoor News. This entry was posted in Uncategorized and tagged Climate Change, Conservation, Environment, Fish, Fishing, Lake Erie, Water Quality, White Perch, Yellow Perch. Bookmark the permalink. In the past few years the standing order for trolling with crawlers for walleye is to bring 4 dozen for each walleye limit because of all the white perch. Some people I know have gone to running spoons and cranks just to keep from catching so many white perch.